She called for close coordination between the two countries to lift two-way trade to US$2 billion with attention given to specific fields. 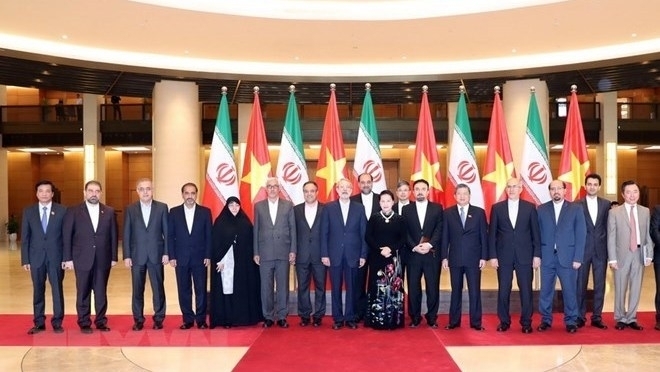 The Vietnamese NA leader expressed the wish to soon receive Iran’s diplomatic note supporting Vietnam’s run for a seat in the United Nations Security Council for 2020-2021, as agreed by the two countries’ leaders. Larijani, for his part, congratulated the Vietnamese NA on successfully holding the 26th Annual Meeting of the Asia-Pacific Parliamentary Forum. He said he believed that the two countries will achieve the trade target, adding that Iran can assist Vietnam in the field of oil and gas, and wants to learn from Vietnam’s experience in agriculture. The Iranian parliament speaker suggested boosting ties in potential fields such as pharmaceuticals, medical equipment, bank connectivity, tourism-culture, film, television, and exchange of lecturers and students. He said while the two sides had operated several chartered flights, they need to consider launching direct flight service to step up economic, trade and tourism development. The two leaders also agreed to bolster supervising and push the effective implementation of the signed agreements, including the deals reached by the countries’ inter-governmental committee.